PawsAbilities Trivia - Two Chances to Win! PawsAbilities is just around the corner, but we don't want to wait until March for the fun and games to start. Starting today, every Thursday until PawsAbilities will be trivia day on our Facebook page. Each Thursday at noon and 8 p.m. EST we'll post a trivia question on our Facebook page about PawsAbilities and Susquehanna Service Dogs. If you're the first person to comment with the correct answer, you win a voucher for a free Dog Olympic Game at PawsAbilities! This game is exclusively for our Facebook fans and we will only be accepting answers on our Facebook page. Not a fan? We would love for you to become one! PawsAbilities is coming up in less than two months and one of many things you and your dog will be able to do are the Dog Olympics! We will have over 20 games for you and your dog to play. Any dog of any skill level can play. Last year we had Great Danes playing right beside Chihuahuas. Just like musical chairs, but with hula hoops! When the music plays, you and your dog walk around a circle of hula hoops, but when the music stops, your dog must sit with at least two paws in a hoop. Another childhood game adapted for canines! On green, you and your dog walk, and on red, you stop. How low can your dog go? Groups of small dogs and large dogs try to crawl under the limbo stick. If your dog loves to give kisses, this is the game for him! The dog that will kiss his handler's face for the longest time wins. Just like it sounds, dogs must clean their plate to win this game. Dogs are given a series of foods, such as dog treats, cheese, hot dogs and lemon slices. The dog that eats it all wins! Become a fan of SSD on Facebook and answer the trivia questions for a chance to win a voucher to play one of these and other Dog Olympic Games! 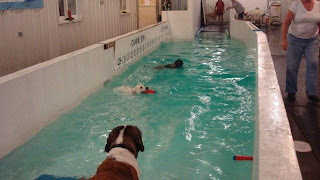 To learn more about the Dog Olympic Games and to buy tickets to PawsAbilities, visit www.pawsabilities.net. It's well below freezing outside, and if you're anything like us, you don't want to spend long periods of time outside. When you have a dog (or dogs), however, you know that you need to take your dogs outside several times a day. In today's Tuesday Training Tip, we will share how to train your dog to eliminate on cue. This can be especially helpful for people who live in apartments or in the city without a yard of their own. If you take your dog for a walk in order to get him to go potty, you may have noticed that it sometimes takes longer and you have to walk farther in order to get him to go. By taking him for a walk to go potty, you're actually teaching him to hold it for as long as possible, especially if you have a tendency to go inside right after he goes. Your dog wants to go for a walk, so when you take him inside soon after he eliminates, you punishing him for going rather than rewarding him with a nice long walk. You will need a lot of patience to train your dog to eliminate on cue, especially if you have an older dog who is used to going on walks to do his business. With patience, however, you will be successful in training your dog. When you go outside, keep your dog confined to one area and wait. You may want to have him on leash. Make sure you stand still and don't walk around with your dog. When they start sniffing around and look like they're about to go, give them the cue. We use "get busy" for our current puppies in training, but you can use "go potty" or whatever cue you would like. Just be consistent. When your dog goes, give him lots of praise! Clean up if it's not your yard. Take your dog for a walk. This is one of the most important steps in training your dog to eliminate on cue, especially if he's used to going for a walk to go potty. Essentially, you are striking a bargain with your dog. He goes potty when and where you ask him to, and then you take him for a walk. To be successful, you must hold up your end of the bargain. Soon, your dog will learn that the cue means to do his business, and he will happily go on cue for you. But what do you do if your dog doesn't go when you take him out? If your dog doesn't go when you take him outside, take him back inside. If you're training a puppy, you may want to crate him for 15-20 minutes. This crate time is not a punishment. It's management so your puppy doesn't go in the house. After 15-20 minutes, take your dog back outside and try again. If he still doesn't go, take him back inside. This is where you'll need lots of patience, because you'll need to repeat this process until your dog does go. But don't get discouraged. With a little patience from you and lots of praise for your dog when he does go, he'll soon learn to go on cue. All of our service dogs learn to do their business on cue and on any surface. Their partners may not have a yard or even live near a convenient patch of grass for the dog to use to eliminate, so the dog must be comfortable using gravel, sidewalk, asphalt, etc. Because service dogs will be accompanying their partners almost everywhere, they need to be able to go when and where it is convenient. If their partner has a busy work schedule and only has ten minutes to take their service dog out between meetings, they don't have time for a 20 minute walk to make sure their dog goes potty. Or the dog's partner may not be able to take them for a walk, so the dog needs to be able to eliminate on cue. It's just another part of how service dogs fit seamlessly into their partners' lives to assist them to be more independent. Help Us Name Midge's and Pearl's Puppies! We have a challenging task for you. We have not one, but two litters of puppies, and we need you to help us name them! SSD Midge and SSD Pearl are both pregnant. Midge was bred to our founding stud, SSD Sweet William, and she's due to give birth around January 27. Pearl was bred to Lobuff Hollyridge Wizard of Oz ("Wizard") and will give birth around February 2. For her second litter, Midge's breeder caretakers have chosen the theme "The Civil War." Pearl's puppy raisers have chosen "Games" as Pearl's theme. Are you up to the challenge of naming two litters of puppies? All of the the names must have something to do with the themes "The Civil War" or "Games." You can suggest more than one name. In fact, please do! Don't forget to suggest both male and female names. We'll announce the puppies' names when they're born. So dust off your history books, open your game closet, and let the naming begin! Just leave your puppy names in the comments. We're off to see PawsAbilities! Lions and tigers and bears, oh my! Well, you won't find real lions, tigers or bears at PawsAbilities 2011, but you will find Toto! In fact, you'll find lots of Totos and plenty of fun things to do with your dog. Bring your dog and your family to PawsAbilities 2011 at the Farm Show Complex in Harrisburg, PA from 8 a.m. to 4 p.m. on March 12-13. There will be lots of things for you to do - Dog Olympics, a costume contest, the Cutest Dog Contest, Paw Draw, Rally-O, the Abrams & Weakley parade and more! You'll also be able to watch demonstrations of all sorts of canine skills, including the dock diving of the Ultimate Air Dogs! Visit www.pawsabilities.net for more information. Tickets are now on sale and cost $8 for adults, $4 for children ages 4-12. These tickets are good for both days of PawsAbilities. In the coming weeks, we will be blogging about the many activities you and your dog can participate in at PawsAbilities. You can also check our Facebook page for more frequent updates. We hope to see you and your dog in March! Most dogs do not like having their nails clipped. Some dogs may not even like having their paws touched, and having their nails clipped may be a traumatic experience. Many people take their dogs to the groomers because their dog really dislikes having it's nails trimmed; however, just because the groomer is clipping the dog's nails doesn't mean it is a less traumatic experience for the dog. It is possible for dogs to calmly allow you, their handler, to clip their nails. Our puppy raisers and trainers work very hard with the dogs to teach them that nail clipping isn't a terrible thing. After a few weeks of training, the dogs learn that the nail clippers mean lots of tasty treats are coming their way, and they calmly allow us to clip each nail. We say that the dogs "allow" us to clip their nails because our training method puts the dog in charge. We use clicker training with lots of tasty treats to teach the dogs that nail clipping is not a horrible thing, and at any point in the process, the dog is allowed to pull their paw away. We never force a dog to submit to nail clipping. Instead, we strike a bargain with our dogs - the dogs let us clip their nails in exchange for tasty treats. 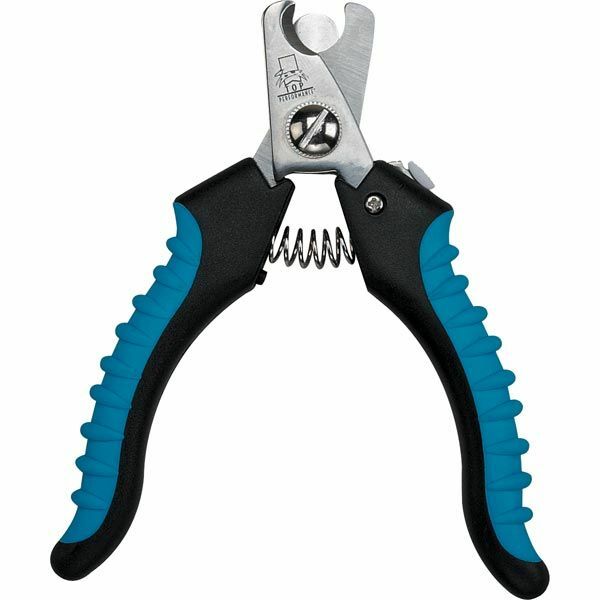 Before we explain how to train your dog to let you clip his nails, we'd like to go over some of the tools you'll need. Make sure you have your clicker and lots of power treats ready. Also, make sure the clippers are out of sight. Many dogs have a negative reaction to the clippers, and you want to begin by making it a positive experience. Begin by simply reaching for your dog's paw. Click and treat your dog for letting you get within 6 inches of his paw. (If your dog doesn't let you get that close, then click and treat for letting you get withing 8 inches, 12 inches, etc. You always want to stop at the point right before your dog wants to pull away.) Repeat 5-10 times and stay at this step until your dog is 80% successful. Once your dog is comfortable with you getting 6 inches from his paw, start moving closer. Click and treat for getting within 4 inches, then 2 inches, then 1 inch. Repeat 5-10 times. Click and treat your dog for letting you touch his paw. Click and treat your dog for letting you hold his paw in the same manner you would hold it to clip his nails. Hold your dog's paw and lightly grasp one nail. Click and treat if he doesn't pull away. Once your dog is comfortable with you grasping his nails, you're ready to use the pen. Your goal with the pen is to slide the dog's nail between the pen and the clip. However, you will need to break this behavior down. Start by just touching the pen to the dog's nails. Click and treat. Gradually work up to sliding the dog's nail between the pen and the clip. This simulates the feeling of the clippers without any of the negative associations that the clippers usually bring. For almost all dogs, the pen is going to be a neutral object. Once your dog thinks this is a good game, it's time to bring out the nail clippers. However, you are not going to immediately start clipping your dog's nails. Instead, you're going to back up and click and treat your dog for letting you touch his paws while the clippers are in sight. You may even have to back up to clicking and treating for letting you get close to his paws. When your dog is comfortable with you picking up his paws with the clippers in sight, begin picking up the nail clippers. You're just going to pick them up, not bring them close to the dog's paws. You may even have to break it down even further and click and treat your dog just for letting you hold their paw while you reach for the clippers. If your dog is comfortable with you holding his paw and picking up the clippers, begin clicking and treating for letting you touch the clippers to his nail. Do NOT clip his nail at this stage! Here's where the toothpick comes in. Hold the toothpick next to your dog's nail and this time, when you bring the clippers to his nail, clip the toothpick. This way, the dog gets used to the sound of the clippers without the pressure of having his nails actually clipped. Next, put the nail clippers around a nail and add some pressure. Do NOT clip his nail. Finally, put the nail clippers around a nail and clip just a tiny bit off. Stay at each step for as long as you need to. You don't want to push your dog too quickly. Make sure your dog is at least 80% successful at each step. For example, if you do 10 trials of each step, your dog must earn a click and treat at least eight out of ten times before you can more on to the next step. Try to do two training sessions a day. Remember to always click and treat your dog every time he doesn't pull his paw away. If he does pull away, let him. He just doesn't get a treat for pulling away. He will soon learn that he is in charge of nail-clipping, but if he wants a treat, he has to let you hold his paw. If you accidentally clip too much and your dog's nails start bleeding, give him a party of treats. Giving him lots of treats reassure him that he has nothing to worry about. Your dog's nails don't stop growing just because you're training him in nail clipping. Until he's comfortable with nail clipping, you can take him for walks on the sidewalk or asphalt, or let him run around on a tennis court. These surfaces act as a giant emery board and file your dog's nails. If you're doing two training sessions a day, it should take approximately two weeks until your dog is comfortable having his nails clipped - but don't worry if it takes a little longer. Work at your dog's speed. Even after your dog is comfortable having his nails clipped, you need to continue treating him. Remember, you've struck a bargain with him. He probably still doesn't love to have his nails clipped, but he has decided that it's not scary and he'll let you do it as long as you have treats for him. So you need to keep your end of the bargain. If you follow this method, you will soon have a dog who calmly lets you clip his nails. 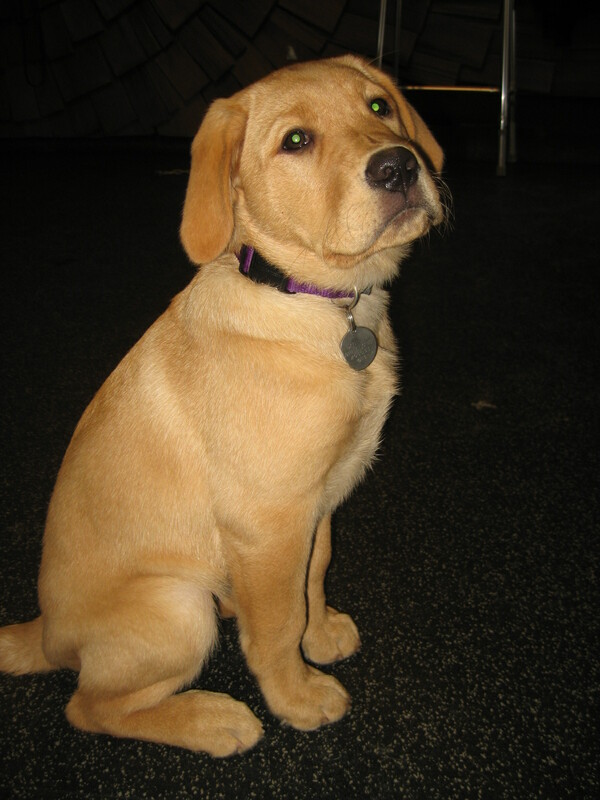 For the next few weeks, SSD Samee Mae is our youngest puppy in training. At the end of the month, SSD Midge's litter will take over as our youngest pups, but until then, Samee Mae holds the title! She is an adorable yellow lab who came to us from Guide Dogs of Texas, and she's doing very well with her training. Right now, she's in early socialization classes, and soon she'll join the rest of our dogs in training in the regular puppy classes. At early socialization class, Samee Mae spent some time running around in the field with SSD Scotia (light yellow lab) and SSD Rio (black lab). She had a blast checking out all the smells and playing with the other dogs! After she had some time to run off some energy, Samee Mae got to meet her dad, SSD Fire! Samee already knows several cues, including sit and down. She does a beautiful down, going right into a relaxed hip roll. Watch her give a down and then sit in the video. 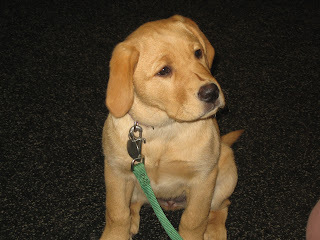 Our dogs start to learn loose leash walking at a very young age, and Samee is no different. Her puppy raiser is working on teaching Samee to walk calmly next to her with the leash nice and loose. This is a very difficult behavior for the dogs to learn, but Samee is making progress. We can't wait to see the dog Samee becomes! It's time for our Tuesday Training Tip! We hope you and you dog have had fun learning self control with the food bowl. Keep working on it! Today's training tip focuses on waiting at doors. Opening a door can be a very exciting thing for a dog. When a dog wants to go outside to play, he'll often try to dash outside before you even get the door completely open. However, it can be dangerous for a dog to dash through a door. You don't always know what's on the other side, and if he's on leash, he could pull you right along with him. If that dog is a service dog pulling a wheelchair or helping someone balance, he could seriously injure his partner by dashing out or in the door. All of our dogs are taught self control at doors. They must wait calmly by the door until the door is opened and they're given a cue such as "go on through," "let's go," or "okay." Only then are they allowed to go through the door. Before you even start training this behavior, make sure it's safe for your dog to dash through the door. He may manage to dash through the door at some point in your training session, and you want to make sure that he'll be dashing into an area where he'll be safe. We recommend putting your dog on leash for this exercise so you'll be able to easily bring him back if he does dash through. Begin training by holding the leash and standing by a door. Slowly open the door. If your dog starts to move toward the door, close it. (Be careful not to close the door on your dog!) The goal is for your dog to learn that he controls when the door opens. If he stays still, it opens. If he moves, it closes. If your dog stays still with the door open, give him treats to reward him. Give him the "okay" to let him go through the door. Repeat these steps until your dog is reliably waiting at doors. If you and your dog are ready for a challenge, you can teach him to go through the door, turn around and look at you. Begin by having your dog wait on a leash at the door while you open it. Tell your dog "go on through." Watch your dog closely as he goes through the door. As soon as he starts to turn his head, click and treat. Be patient and wait for the dog to turn his head, even if it seems like it's taking a long time. When your dog gets good at turning his head after he goes through the door, start waiting for him to look at you before clicking and treating. As with any behavior, when you're training this behavior, you need to be consistent. If you sometimes let your dog dash through the door, he will always try because he knows that sometimes it will work. You need to be consistent and always make your dog wait. There are a few exceptions to making your dog wait. For example, we never make puppies that are not housetrained wait at doors when they need to go outside to relieve themselves. Happy training! Let us know in the comments how you and your dog are doing. SSD Onyx is one smart dog. She learns new behaviors very quickly. Last semester in puppy class, we had all the dogs work on learning "heel" by first pivoting their back feet around a box until they were in the heel position. Once the dogs pivot their back feet around the box, we remove the box and have the dog pivot into a heel position with all four feet on the floor. Onyx quickly mastered the box and later heel on the floor. "Heel" is now her favorite cue. In fact, she can be across the yard playing and when her puppy raisers say "heel," she comes running up and snaps into the heel position. Onyx tends to get worried around other dogs or other dog smells, though. If she's around other dogs or in an area where there are lots of dog smells, she has a very difficult time focusing. Sometimes it doesn't even matter what kind of treats her puppy raisers Mark and Carol have. She just puts her nose to the ground and sniffs everything. To help her get over her worry, Mark and Carol are slowly easing her into situations. For example, the pet store is full of other dogs and dog smells. When they take her to the pet store, they don't just get her out of the car and walk right into the store. Instead, they get her out of the car and walk through the parking lot, clicking and treating for a loose leash, to the point where she just begins to get worried about all of the dog smells. Then they turn around and go back to the car. When she has calmed down enough to focus again, they try again - walk through the parking lot toward the store to the point where she starts to get worried, then turn around and go back to the car. Using this method, eventually Onyx should eventually be able to walk right up to and inside the pet store without a problem. The theory behind this method is that as you and the dog continually approach the thing or area that is causing the dog worry, the dog realizes that it's okay and there's nothing to be worried about. Mark and Carol are also putting Onyx on leash while she's in the house. The idea is to get her to associate the leash with calmness and safety, so she'll realize that there's no reason to get excited just because the leash is being put on. Although there are times when it's very challenging for Onyx to be around dogs and dog smells, there are other times when she takes it all in stride. About at one of our puppy classes, she had no problem focusing on her puppy raisers. We even played Dog, Dog, Bone (the canine version of Duck, Duck, Goose), and she was fine with all of the dogs being in very close proximity to her. And over Thanksgiving, she was in the Baltimore Washington International Airport and did great, despite the fact that they were in the heart of the airport. From these experiences, her puppy raisers know she is able to focus in challenging situations. It's just a matter of helping her realize that she can do it in all situations. Onyx is currently spending time with one of our puppy sitters, and she's going to school with her sitter. We hear that she's been doing very well in school! We're looking forward to seeing how Onyx progresses! Nubble joined us in Harrisburg for puppy class on Wednesday! We were very happy to have him in class. It gave him the chance to be around other dogs that he isn't familiar with. If you'd like to read about our puppy class and see some videos of Nubble, check out Fun and Games at Puppy Class. In the Northeast group's puppy classes, they're learning musical canine freestyle or dancing with dogs! Nubble loves it! He loves to learn new things. Right now, he, Donna and Lindsey are in the very beginning stages of learning freestyle. Donna and Nubble have been watching videos of musical freestyle. At first, Nubble just barked at the dogs on the screen, so Donna turned it into a training opportunity. Now he just rests his head on Donna's lap and watches the screen. They also practiced "stand stay," where the dog stays in a standing position while you walk away. This can be very difficult for dogs because it's very easy for them to simply follow you since they're already in a standing position. Nubble, however, was a pro. Donna and Lindsey realized that they had actually been working on this behavior for a while now because they always make him wait at doorways. As well, they worked on walking around an object. For example, if the dog gets his leash tangled or walks around a street sign on one side while you walk on the other side, he'll be able to untangle himself. The week after Christmas, his puppy raisers took Nubble back to the mall. They practiced steps and just walked around. We always give our dogs the opportunity to potty before we enter a building, but that doesn't mean they will always use that opportunity. Nubble didn't go before he and Donna went inside the mall, so Donna watched his body language closely, and as soon as he started acting like he needed to go out, they headed straight for the nearest exit. Nicely done! Nubble did his business on the sidewalk, which is also a good thing. Service dogs need to be able to potty on all surfaces. When they're placed with a partner, they may not live near a grassy area, so they'll need to be comfortable with whatever surface is available to them. And even if a service dog does live in an area where he has a yard, he and his partner may visit places that do not have grass and bushes available. For example, if they fly, the dog will need to be able to go on concrete before getting on the plane. Once on the plane, it could be hours before the dog has another opportunity. Great job, Nubble. A few other puppy raisers recommended that Donna and Lindsey take Nubble to the Canine Spa in Dillsburg, PA. Nubble had a blast! Donna was a little concerned about taking Nubble into a strange place where there are lots of strange dogs off leash, but Nubble took it all in stride. 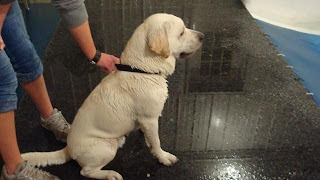 A three-year-old Saint Bernard dashed right over to him, and the two dogs romped and played. Nubble also had fun with a young black lab and an older yellow lab. He was very sweet with the older lab. Then SSD Cabo and SSD Pearl came in! All of the dogs got along well until Nubble and Cabo wanted to same toy. However, once they got the dogs calmed down again, they gave Nubble and Cabo some time to get to know each other, and soon they were able to co-exist. Nubble tended to avoid Cabo's toys, and Donna and Crystal always made sure to toss two toys if both dogs were in the water. At one point, Lindsey tossed a toy more that halfway across the pool. 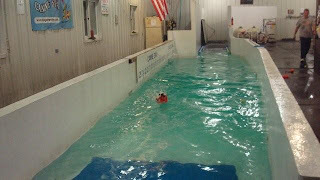 Nubble swam to get it, but then he couldn't figure out what to grab, so he grabbed the foam pool noodle that covers the metal rack for the dock at the other end of the pool. He then swam all the way back to Lindsey with it! They used the Canine Spa to practice recalls, and Nubble did very well considering all the distractions. He also showed good self control by sitting and waiting until a toy was thrown for him. It was a wonderful trip, and needless to say, Nubble slept very well that night! On Sunday, Donna and Lindsey took Nubble to Cracker Barrel. Six months ago, Nubble would have had a very difficult time, but now, he did great! Donna called ahead to let Cracker Barrel know that she would be bringing a service dog in training. (Although this isn't necessary for places that cater to the public, it sometimes helps.) When Donna put their names on the list, she said two people and a service dog, and when their table was ready, the hostess announced, "Party of three!" Nubble did great walking through the busy dining room. Once they were settled at the table, he just rested beneath the table and did the occasional visit on Donna's lap. At one point, the waitress came over to pull down the blind at their window. She had to reach over Nubble, but he didn't even move! He just looked at her. Great job, Nubble! When their food arrived, it became a little more challenging for Nubble. He smelled the bacon and that's all he could think about. It took a little while for Donna and Lindsey to help him realize that he was not going to get any bacon, but he eventually did settle back down under the table. When they left the restaurant, he strolled through the dining room on a nice loose leash, and while they were paying, he waited patiently without even trying to sniff any of the tempting items at the counter! What a successful outing! We're looking forward to more stories of Nubble's success! 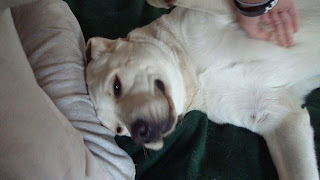 Nubble loves belly rubs! Look at that smile! It's a new semester of puppy class, and the dogs are learning some new behaviors. The puppies in training are going to start working the cue "paw," where the dog calmly places his paw in his handler's hand. On the surface, this seems like it's just a cute trick, having the dog shake hands. 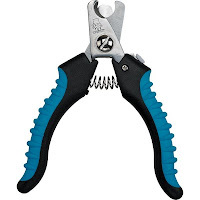 However, it can be very important for nail clipping. All of our dogs must be comfortable having their nails cut, and "paw" can be used to have the dog give his handler his paw so his nails can be cut. The puppies are also learning to use a target stick. A target stick is a piece of duct tape at the end of a wooden dowel or some sort of stick. Goal is to have the dog calmly touch his nose to the duct tape. This teaches the dog to target duct tape with his nose, and we can then use this skill to teach more advance behaviors, such as pushing a button to open an automatic door or touching a person's leg to alert them to a sound. Watch SSD Rio touch the target stick with her nose. Loose leash walking is one of the most important skills a service dog can have. The dog must learn self control to walk nicely beside his handler with the leash in a loose J shape. There are many methods of teaching loose leash walking, and the method you use depends on the situation. In the new method we taught last night, handlers walk backwards while the dog walks forward on a loose leash. Handlers click and treat the dog for walking on a loose leash. This method is often successful because the dogs are not used to pulling when they're walking toward you, so they should be walking on a loose leash. Watch SSD Sienna, SSD Zappa and SSD Nubble, who joined us from the Northeast, demonstrate the new method of training loose leash walking. Although loose leash walking is an extremely important skill for service dogs, it's not the most exciting skill to teach. To make it more fun, we played musical hoops. Musical hoops is a game similar to musical chairs, only we substitute hula hoops for chairs. The hoops are arranged in a circle and while the music is playing, the dogs must walk around the circle on a loose leash. When the music stops, each dog must sit with at least two paws in a hoop. Of course, there is one less hoop than there are dogs. The dog without a hoop was eliminated from the game, we removed one hoop, and the dogs continued walking on a loose leash. We continued playing until there was only one dog left. All of the other dogs practiced very nice down-stays. Watch SSD Jagger, SSD Nubble, SSD Taz, SSD Topaz and SSD Yukon play musical hoops. When the weather turns cold, and you and your dog are spending less time outside together, it's the perfect time to teach your dog new tricks and behaviors. The Association of Pet Dog Trainers (APDT) has selected January as National Train Your Dog Month. Training your dog is a wonderful way to build the bond between you. 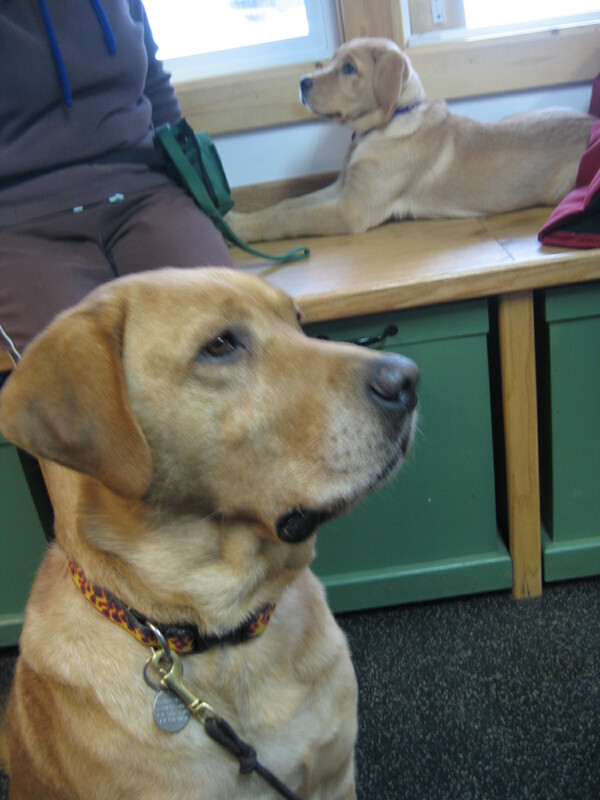 We use clicker training to train our service dogs, and it's fun for us and the dogs. Our dogs love when the clickers and treat pouches appear. Clicker training uses positive reinforcement. The click of the clicker marks a very specific behavior, and the dog immediately gets reinforced for it, usually with a piece of food. The dog will then repeat that behavior in the hopes of receiving another click and treat. Using this method, it's very easy to quickly shape a behavior that otherwise may take months. 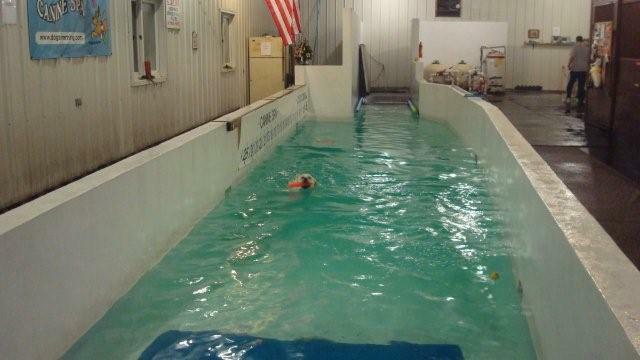 Once a week in January, we will be posting a new training exercise for you and your dog to try. Although today's training tip is appearing on Wednesday, future tips will appear on Tuesday. Most of the dogs we train are labs, and as you may know, labs are motivated by food. They love to eat almost anything they can get. At meal times, they have a tendency to dive head first into their food bowl, only coming up for air once the bowl has been licked clean. One of the very first things we start teaching our puppies is self control, which may be the most important skill a service dog can have. We start teaching self control with the food bowl. At meal times, all of our dogs must sit and stay (uncued) until the full food bowl is placed on the ground. They must then continue to sit and make eye contact with their handler until given the cue "okay, " which releases them to go eat. Watch the video of SSD Thunder demonstrating self control around the food bowl. If you watch closely, you'll see his eyes flick upward toward his handler right before she gives him the "okay." 1. After you put food in your dog's bowl, stand and hold the food bowl in front of you. Without using any words, wait for your dog to sit. This may take a while, but your dog will sit eventually. 2. Slowly lower the food bowl to the ground, but be ready to pick it up again if your dog moves toward it. If your dog moves, simply pick up and hold the food bowl until he's sitting again. 3. Once the food bowl is on the ground and as soon as your dog pauses momentarily, say "okay" and let your dog eat. 4. Gradually increase the amount of time that your dog waits before you give him the "okay" to eat. Eventually wait for your dog to make eye contact before saying "okay." If your dog manages to get to his food bowl before you give him the okay, do not punish him. Simply try again at the next meal and make sure you're faster at picking up the food bowl when he moves. Be patient and don't try to push your dog too fast. This can be difficult for him, especially if he's used to diving right into his food bowl. It will probably become easier after about five days. If you're consistent and keep at it, you'll soon have a dog that will sit and stare at you while his food sits right in front of him. Happy training! Let us know how your dog is doing in the comments. SSD Pearl is going to have puppies! She went to the vet yesterday for an ultrasound, and the vet saw about 6 puppies. She's due to give birth around February 2, 2011. 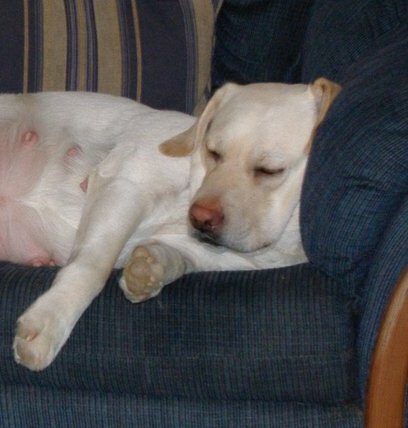 About a week ago, we announced that SSD Midge is also pregnant, and her puppies are due around January 29. Our whelping team is going to be very busy in less than a month! We will be announcing the litter themes soon, so you can help us name the puppies. Why do we breed service dogs? SSD Midge is pregnant, and tonight, we find out if SSD Pearl is also going to have puppies. In approximately one month, we could have two litters of puppies! Both Midge and Pearl were bred to specially selected males, and we're hoping for two litters of healthy puppies with the right temperament to become service dogs. One of our fans asked a great question about breeding dogs on our Facebook page. She said, "I love what you're doing to help people with physical challenges, but why aren't you adopting and training dogs from shelters when there are millions of dogs euthanized each year?" This is a great question and an important one. Thank you for asking! We believe that dogs should never have to end up in shelters. 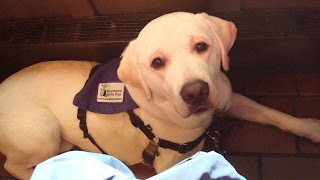 When we first started training dogs to be service dogs, we went to humane societies and Labrador Retriever and Golden Retriever rescue groups to find dogs to adopt and train. However, it was very challenging to find dogs who would be appropriate for service dog work. Many of the dogs who would be suited to service dog work are the ones who would be instantly adopted. We usually use labs because they tend to love people, they enjoy working, they're easy to care for, and they have soft mouths, meaning they can retrieve and hold objects without damaging them. However, labs tend to be quickly adopted from humane societies and shelters. When we did find dogs to adopt and train, most of them didn't make it through our program. 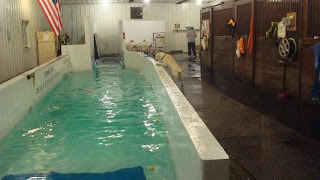 We had to discharge most of the dogs because they had health and temperament issues. Many of the dogs developed hip or elbow dysplasia, which can cause early arthiritis. The dogs would not be able to work for very long, they may need medications, and ultimately they would not be able to meet their partner's needs. We cannot in good conscience place a dog with a person when we know that dog will only be able to work for a few years before retiring and needing expensive medication that their partner may not be able to afford. When we place a service dog with a partner, our goal is to enrich that person's life with a dog that can assist them to become more independent. 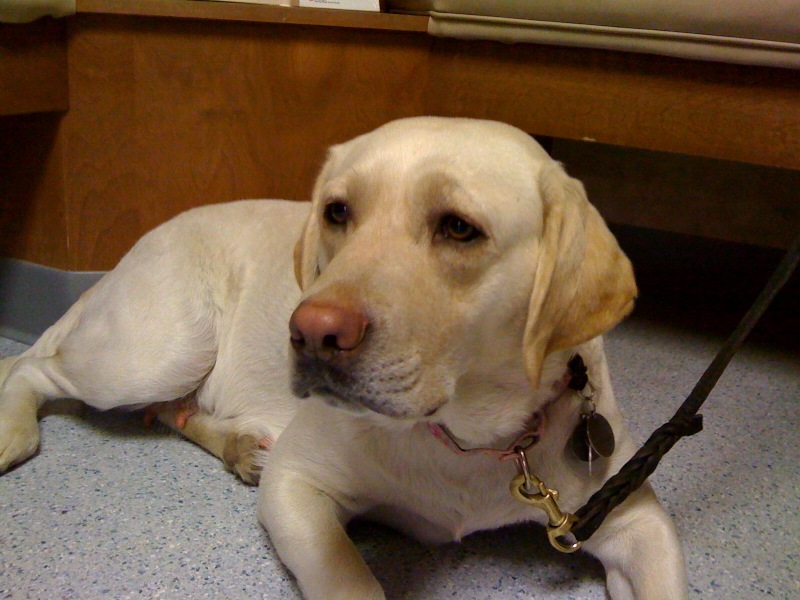 All of our dogs must pass health exams showing that they have good eyes and bone structure. Besides being healthy, service dogs must have a good temperament. We look for dogs that are calm, have the ability to focus despite distractions, have self control and can easily adapt to different environments and situations. Dogs that are too timid or excitable may not be suited to service dog work. For example, a dog that is easily frightened in new environments may freeze in place instead of retrieving their partner's keys that were dropped in the mall parking lot. A dog that is too excitable may dash after a squirrel rather than staying right next to his partner to help them balance as they walk. In this particular example, the excitable dog may actually unintentionally harm his partner. We also think about the dogs themselves. It wouldn't be fair to try to turn timid or excitable dogs into service dogs. 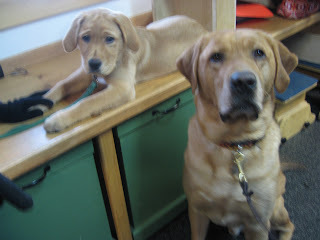 Because of their temperaments, they wouldn't be suited to service dog work, and they would be constantly stressed out. We look for dogs that can easily relax in almost any situation. We always think about what would be best for both the people and the dogs. Since we began breeding labs to become service dogs, we have had a 70-80% success rate. We know the health histories of the dogs, and most of our dogs have a temperament that makes them well-suited to service dog work. We feel confident that when we place a dog with a person, that dog will be able to meet that person's needs and assist them to be more independent for many years. We feel very strongly about not adding to the dogs who are already unfortunately in shelters and humane societies. If we do need to discharge a dog, we always find a loving home for him. Always. And once a dog has been placed with a person, we will always take the dog back if that person needs to return him for whatever reason. Dogs that come back to us may be re-trained for another person, depending on how old they are, or they may retire and become beloved pets. Thank you so much for your question!